Restaurant Week is an epic, 7-day culinary affair that takes place in every fortunate metropolitan city from Los Angeles to New York. During this event an assortment the city’s finest, chic and most trendy restaurants offer a selection of their menu at an unreasonably low, fixed price. I was in Washington D.C. this past summer when the gastronomic festivities began. Friends were contacted, reservations were made, and we immediately began eating our way through the seemingly endless list of fabulous restaurants. If I had to play favorites, Mie N Yu, a small restaurant in the heart of Georgetown, wins my vote. Each dish was perfectly orchestrated from taste to presentation and offered sophisticated flavors in each bite. Many of the other restaurants, however, also had spectacular food; so, what sets Mie N Yu apart? Décor. It was absolutely stunning and perfectly complemented the entire dining experience. And if you visit, your experience would not be complete without a trip to their restroom, which has won numerous awards. My favorite dish of theirs was an amuse-gueule that featured chorizo-stuffed medjool dates. The flavor profile was divine: the sweetness of the date was perfectly paired with the saltiness from the chorizo. Then the chef wrapped this heavenly concoction in crispy bacon and plated it over a bed of Spicy Moroccan Harissa Sauce. To make the sauce, process the harissa paste, the drained roasted red bell peppers and lemon juice. Slowly drizzle 2 tablespoons of extra virgin olive oil to create a light emulsion and add a pinch of salt for seasoning. Coat a large sauté pan with the remaining olive oil and set over medium-low heat. Slice the fennel and shallot thinly and sweat for 8-10 minutes, or until translucent (add the salt to help break down the veggies while cooking). Remove the wrapper from the chorizo and pulse in the food processor until it reaches a coarse ground consistency. Combine the fennel mixture and ground chorizo in a medium bowl and set aside to cool. In the mean time, pit the medjool dates and create a small nest for the chorizo filling. In a large baking sheet, par-bake (approx. 5-7 minutes in a 350 degree oven) the bacon in order to render some of its fat before wrapping. This can be done in advance and also allows the bacon to crisp up quicker when baking the second time. 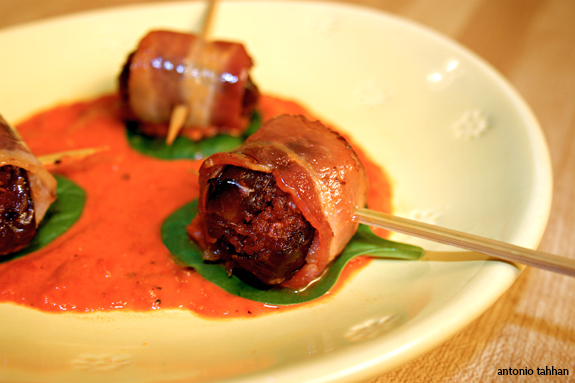 Stuff the pitted dates with the chorizo filling and individually wrap them with the par-baked bacon. Bake in a 400 degree oven for 5-7 minutes, or until crisp. Plate over a bed of the Roasted Red Pepper Harissa sauce and enjoy! notes:: Inspired by DC restaurant, Mie N Yu. You can make the filling the day and par-cook the bacon the day before. Posted in appetizers, North African, recipe, savory, Spanish by Antonio Tahhan on October 21st, 2007. You can follow any responses to this entry through the RSS 2.0 feed. You can leave a response, or trackback from your own site. Hi Tony! Thanks so much for your rendition of this mouthwatering dish with us. The flavor combination sounds amazing!!! We are very excited to have both the recipe and the delicious pic in this week’s Recipe Roundup. Thank you!